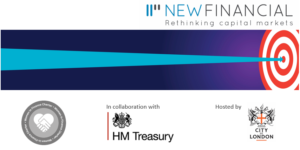 HM Treasury in collaboration with New Financial present the launch event of the second Annual Review of the HM Treasury Women in Finance Charter, hosted by the City of London Corporation. This is an opportunity to gain insight into the progress of Charter signatories, celebrate successes, discuss best practice around the principles of the Charter, and network with your fellow signatories. We expect attendees to include accountable executives and Charter contacts at signatory firms. We encourage all firms to send both men and women to the event. Email events@newfinancial.org if you are interested to attend.